The German movie Deutschland bleiche Mutter aka Germany Pale Mother is a heavy movie. Heavy, tragic and depressing but excellent. Eva Mattes gives an absolutely outstanding performance. When the movie begins we hear the deep voice of a woman recite a poem by Bertold Brecht, (you can read it here Germany – Deutschland), in which he calls Germany “a pale mother”. This sets the tone. The movie is literary and symbolic and deeply rooted in German culture. The story is to a certain extent told by Anna, Lene’s daughter. In a voiceover she narrates her beginning, how her parents met in 1939, just before the war, how they got married, how shy and awkward they were, how her father was sent off to the Eastern front and little Anna was born during an air raid. When their house is bombed, Anna’s mother decides to leave for Berlin. We see her stand in the ruins, before she leaves, she tries to find something, anything but all has been shattered, broken, they don’t have much more than their lives and a few clothes. In Berlin they live in the empty house of relatives. Hans is on leave and joins them but the stay is very difficult for all of them. Anna is jealous of the father she doesn’t know. Lene feels estranged and wants to be alone with her daughter and Hans is tired, very changed and disappointed. The movie follows the lives of these three people until after the war when everything seems to be normal again but is not. Her mother contracts a very mysterious illness and a doctor advises to extract all her teeth. She becomes highly depressed and wants to die. Her husband is equally miserable and abandons her emotionally. In the middle of the movie there is one long impressive scene in which Lene walks with Anna through the woods. She has left Berlin because she is afraid to die in an air raid. On the way she tells the little girl a story. It sounded quite familiar and I had an idea it was a fairy tale of the bothers Grimm. I managed to find an English translation of it. The Robber Bridegroom is one of the bloodier fairy tales the Grimm’s have collected. There is a lot of symbolism attached to the forest in Germany. This started a long time before WWII but it culminated during the war. The scene of Lene walking through the woods and telling this gruesome tale to her little daughter is very oppressing. And what happens in the woods even more so. 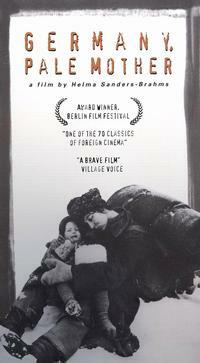 In Germany Pale Mother director Helma Sanders-Brahms told the story of her own parents. It shows how much the life of the Germans was shattered, how they desperately tried to go back to normal which is symbolized by the coffee ritual in the sitting room. What made sense before the war has become some sort of cruel mockery. Things are changed forever. Germany Pale Mother is German narrative cinema at its best. I attached an excerpt of the movie. The full movie can be watched on YouTube. This entry was posted in History, Movie, Reviews, Uncategorized, War Movie, WWII and tagged Deutschland bleiche Mutter, Eva Mattes, German movie, Germany Pale Mother, Helma Sanders-Brahms, History, Movies, Review, War Movies, WWII. “The feel good movie of the year!” Wow, you have reviewed some depressing movies, but this might be the ultimate. I do not want to offend you, but I will not be watching this any time soon. Maybe after America solves its debt problem. I don’t want to go over the depression cliff right now. I wouldn’t have recommended it to you. It’s in the vein of Hiroshima Mon Amour but more depressing. It explores extremely interesting aspects and was highly criticized for showing tha the Germans suffered too. In Germany btw… You have to read that fairy tale… She tells this to her 4 year old in the movie. I remember I was read this too at a very early age. I guess in the US where everything is censored that would not seem fit for kiddies. This is a great movie indeed, the mood of an era. Bleiche Mutter vs Vater-land, and a facial half-paralysis to sum up Germany’s divide. Haven’t seen it since the early 80s though, I’m glad it stood the test of time for you. It did, it’s clearly from an era in which German filmmaking showed still much more European than American influences. Recently, if it wasn’t for the language, you could hardly see a difference. The movie is subtle, also depressing but that fits the topic.